Have you ever wondered how to make tender beef shish kebabs? I’ll let you in on my secret. Shish kebabs are so much fun to make and eat, but if not done correctly, the meat can be overdone and tough. Ideally, you want the meat to be tender and full of flavor when you cook it. I am a Certified Angus Beef Brand Ambassador. This post contains affiliate links, and I will receive compensation if you make a purchase after clicking on my links. When it comes to beef shish kebabs, I prefer them to be cooked outside on the grill. Given our Vermont winters, that usually only happens between the months of May and September. After that, it’s just too cold to stand in the driveway and cook dinner on the grill. Thankfully, you can cook shish kebabs inside when it’s too cold. I really prefer to marinade my beef for at least eight hours before I grill it. A marinade just adds so much flavor to your beef that it’s something I almost always do. You don’t need to run out and buy a bottle of marinade, you can simply let the meat sit in a simple marinade of olive oil and lemon juice. Sirloin Tip is the cut I generally look for when making beef shish kebabs. It’s affordable which is important when you’re feeding six hungry adults. But, it also has an amazing taste and texture when cooked properly. If you have a bit of extra money to spend look for filet mignon or tenderloin. You’ll have to experiment to find the best cut of beef for shish kebabs in your family. You can even use stew meat for kabobs if you prefer. Of course, you want to get Certified Angus Beef for the best taste and remember to look for beef that is marbled which will help ensure it’s tender and juicy. Pieces should be uniform in size to ensure they cook evenly. 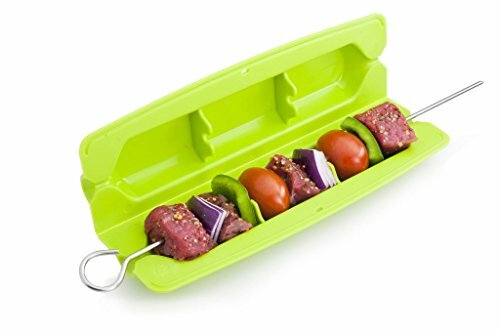 I prefer to use metal skewers when I make shish kebabs because they help cook the beef from the inside as well as the outside. 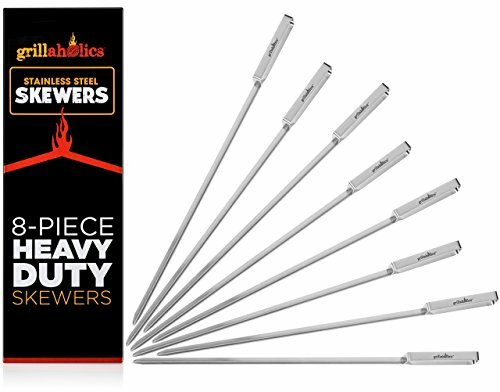 Plus, they are reusable which cuts down on the cost of new skewers each time we want to grill. 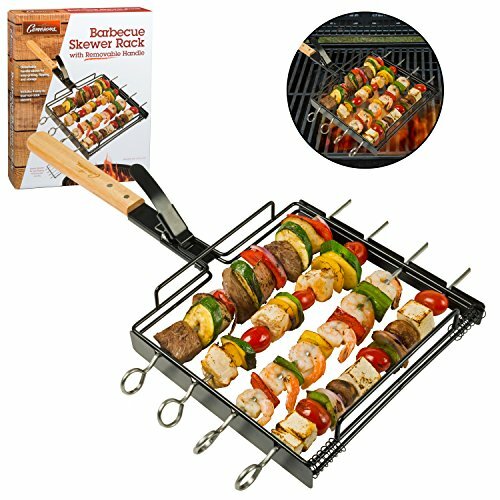 Non-stick stainless steel is the best option and using a shish kebab rack makes the process so much simpler. Of course, you can fill your shish kebab skewers up entirely with beef. That’s my husband’s preference. But, you may want to add in fresh fruits and vegetables for a little bit of variety. When you load the skewers, leave a little bit of space between each piece to ensure everything is cooked evenly. Foods like green and red peppers, pineapple chunks, onion, summer squash, cherry tomatoes, mushrooms, and even baby potatoes work wonderfully. Do you have any tips for making tender beef shish kebabs? I am going to have to make my family kabobs. I've been grilling for a long time and never treated them to this. Your pictures look so yummy. Thanks for the tip about the metal skewers! Thanks for the great tips I need this help. These look so good! I have not grilled much therefore am not good at it but the way you described it helps so much. I have not seen a rack before sonineill check that out. Thanks for the tips. I can certainly use them.